Metal gates are common, because they are strong and last many years. The problem with them for many people, however, is that they offer little or no privacy. If you would like your gate to stop people from being able to look into your yard, or to block your view of unattractive surroundings, one of the simplest solutions is to add solid strips to the gate. This is frequently done on one of the more commonly used types of metal gates, chain link. Adding wooden slats is handled in the same manner as adding aluminum or PVC slats. Wooden slats can add a lot of privacy to a metal gate. Plan your layout of wooden slats in the concave areas created by the fence links on the inside of the metal gate, which is the side that faces your house or driveway. The concave areas run diagonally along the fence, from the top to the bottom, and are located between rows of raised fencing wires. Lay a wooden slat in each concave diagonal space until you have covered the width of the gate. Put the top and bottom of each slat under the top and bottom fence wires, but don't weave it through the rest of the slats. You may need to trim a few of the slats to fit them at the ends of the gate panels, so they don't extend beyond the top or bottom of the gate. Start at one side of the gate and weave a slat through all of the wires, angled in the opposite direction of the first slats. This slat should go over the first layer of slats and under every wire in the fence. The wires will hold this secondary slat in place, and that slat will hold down the first layer of slats. 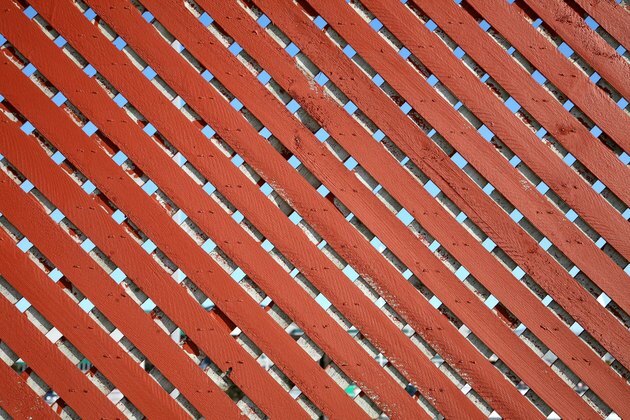 Count over five diagonal spaces and then repeat the process of weaving a secondary wooden slat into the mesh of the fence. You must do this all the way across the gate to hold the first layer of slats in place. Trim the slats as needed to fit at the ends of the gate. Check the top and bottom of the slats to make sure that the first layer of slats are completely secured by the second layer.